Let’s face it, trade shows can be overwhelming —especially if you’re exhibiting. From the time your team selects a conference or trade show to exhibit at, the pressure is on to execute against some pretty extreme deadlines. 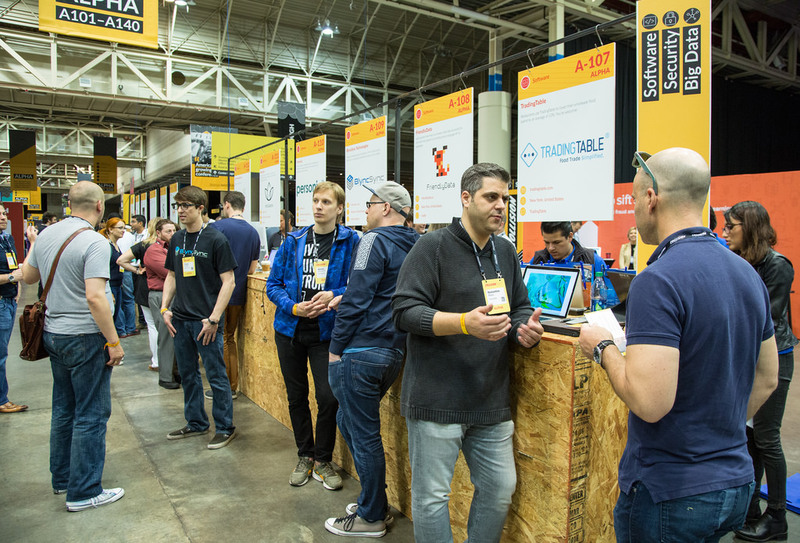 The first deadline, usually, is deciding how big your presence will be at the event and then securing the best booth location to solidify your presence. 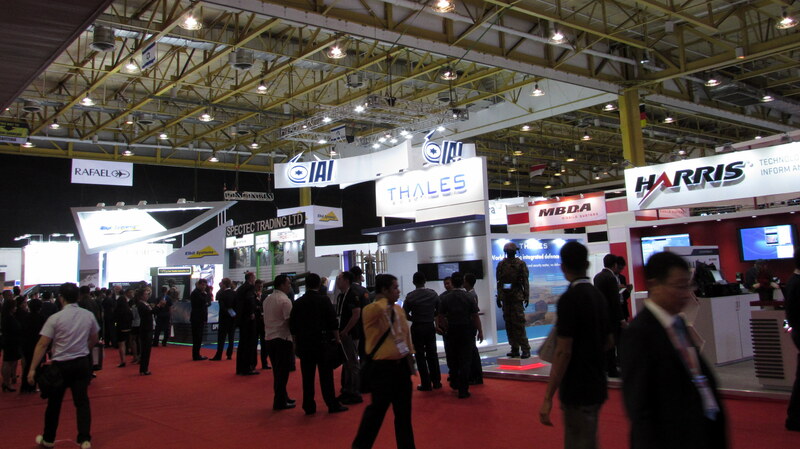 While not the main determining factor of conference or trade show success, securing the best booth location on the trade show floor is still a large component to your trade show marketing strategy, as it impacts both the quantity and quality of the potential engagement. Rather than stressing out about how to secure the best booth, keep reading to discover the top strategies teams use to make sure they lock down the top spot for their brand before it’s too late. The very first thing we recommend teams do when trying to secure the best booth location is to break out their calculator. If you’re like me, you’re about to close this article for the sheer mention of doing math. But, stay with me as understanding the potential revenue opportunity at the event should play a huge factor in determining the best booth space for your brand. You probably have a budget for the event (if you don’t, that’s another problem!). With your budget, you need to not only purchase the best booth location, but you also need to factor in things like travel, labor for setup and teardown, swag, and about a million other details that go into a trade show budget. Knowing how your team plans to delegate this money across the various needs is crucial to understanding exactly how much you can spend on securing the best booth location and if you need to prepare for the haggle (which is why the next step is so important!). The moment you know that your team is attending an event, you should be contacting the event organizer and establishing a rapport. This is a huge relationship opportunity that, if done right, could save your company thousands in the long run. Take the time to foster the relationship with your event organizer rep months before event sponsorship opportunities open up by being the warm, friendly marketer I know we can be. Sometimes event organizers will allow their VIP sponsors (or those they have close personal relationships with) first dibs on their perfect booth space. And, if you’re a little late to the game, they may recommend the best booth location for your team based on their knowledge of your company. Make sure you’re keeping these relationships fresh throughout the year and not just when you need something from them. We shoved this one down on the list as it is pretty obvious. But, not everyone knows the infamous A approach to picking the best booth location. The chaos on an event floor can seem, well chaotic, but you can make sense of this mess with a little studying. Research the schedule to know when keynote speakers will be presenting or big brands will reveal new technology, then implement this information into your team’s agenda for the event. For example, maybe a team member or two can be designated networkers at the keynote. Get a feel for the general layout of the event and see how your booth location is situated in relation to major traffic areas. It will also be helpful to know where concessions and bathrooms are located, as well as the location of your competitors’ booths. The better feel you have for the event’s layout, the more prepared your team will be to capture prospects and convert them. The infamous A pattern is a good go-to if you’re not sure where to place your booth. A secret hack is to go one step farther and find the “overlapping As” when choosing the best trade show booth location. You’ll find that the best booth location might seriously surprise you and your team when using this methodology. 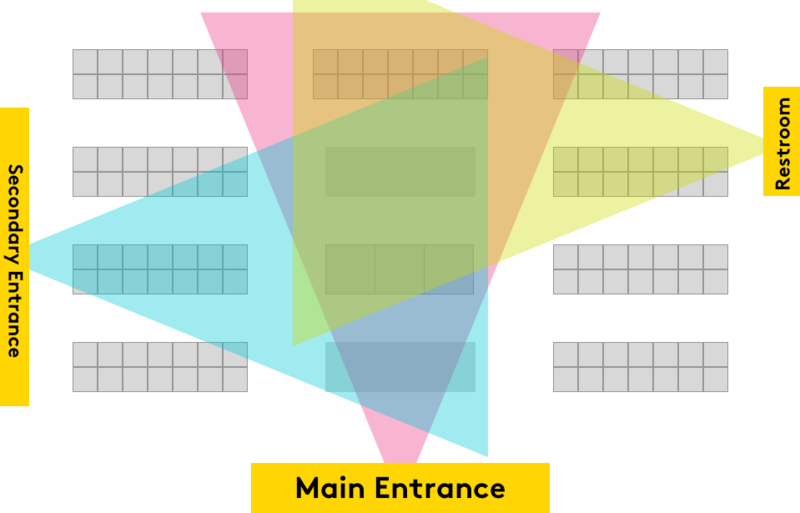 As seen below, based on the layout of this mock trade show floor, some of the best booth locations are actually at the very back of the event space. Two expo booth locations can be better than one, if you strategize properly. As an alternative to the single large booth option (20x20), shoot for two decent booth spaces (10x10) with clear benefits, like proximity to a shareable moment or a big, relevant brand. There’s only a handful of perfect spaces, but there’s dozens of ways to position two booths for optimal exposure. Everyone’s eye is on that one perfect expo booth location, and if you’re a smaller company it will be more difficult to attain it. Take a smarter approach and acquire two smaller booths at key points where your target audience will likely convene. If you’ve invested in a permanent booth structure, ask your designer or agency team if there is a way to assemble the structure into two smaller booths that bring just as much dynamite to the trade show floor. This is a great option for extremely large trade shows with multiple expo halls (or a single, large one) and those a little late to the game on registering but who still want a large, multi-touch presence. Even if you have the budget for the best and biggest booth location at any given event, you should always be analyzing if bigger is actually better. Those big, high-tech booths can be a real turn-off to some attendees as they’re usually daunting and not very inviting. Think about what your target buyer at the event would like to interact and design from there. Maybe your buyer is an IT professional who absolutely loathes networking and really just wants a one-to-one product demo where they can tinker. While a big booth presence with sales teams smiling and trying to engage folks down the aisles might seem like a good idea, it could be a turn-off to your actual buyer. Smaller groups are much easier to convert because you can give individuals more quality time to talk about the value you offer. If you do choose a large booth area, you can still design the flow to make the experience seem smaller with several focal points and interactive stations rather than empty, open space that can be intimidating. However, if you plan to showcase any parts of this partnership on the trade show floor, it needs to be a sensical partnership. Choose your partners wisely, as a smaller company might be looking to piggyback on your reputation. You want to make sure you’re getting just as much out of the partnership as they are. This is especially useful if you’re purchasing your booth a bit behind schedule and many spots are already full. Take a look who is around the area you’re looking to book and see if you have similar target buyers, and if you do, book that space immediately! While it may seem obvious to select a spot right next to the big brand’s flashy booth, this might not be the best decision for your brand, especially if your brand and that big brand have absolutely zero customers in common. Use your neighbors strategically, but don’t make this your only strategy when picking a booth location. As much as we all wish everyone was our target audience, they’re not. Your personas have specific tastes and habits, and that will guide them toward certain locations. Consider the opportunities for impressions outside of your booth space. You could be at the entrance as a sponsor of the swag bag. You could be on sponsorship banners or speak at a partner brand’s booth. Remember, people are at the event to experience new things, so take advantage of this expectation across the trade show floor. At the end of the day, the best booth location is wherever your target customer will see you. That might mean one giant, front-and-center booth or several smaller booths and activations throughout an event. But, whatever you do, you need to make sure you have a plan to secure your spot before it’s too late. While we’ve talked about the importance of scoring the best booth location, it’s not the main determining factor in your team’s trade show success. Having a detailed plan for reaching out to folks to schedule meetings before the event, a way to manage those meetings while you’re there, and an easy, relevant way to follow up after every event is what will truly make your team successful.